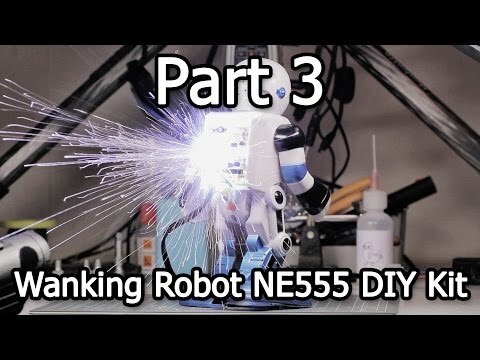 A 555-based robot kit which apparently is of shoddy quality and sullies Banggood's good name. I tried to order one for a shot at robo-redemption but sadly it's sold out. Did you manage to grab a schematic? I guess it would be easy enough once you get a couple of servos running. Twice the price of Banggood. Ten for 73 cents USD. Aside from the quality I have to wonder how much "educational value" something that simple would have. Ask and you shall recieve, schematic, board layout and parts list. Not sure how much fun this would be, the whole circuit deals with controlling the motors.if all it does is walk, it needs more 555s to blink some lights and make some noise. Do you notice the three 5k resistors? This is how the chip got it's name. And sometimes you think its because it sounds catchy. Where did that 555 diagram come from? The upper comparator position and connections look a bit off to me. 40 pcs for $1.76. Pure unadulterated madness at 4.4 cents each. 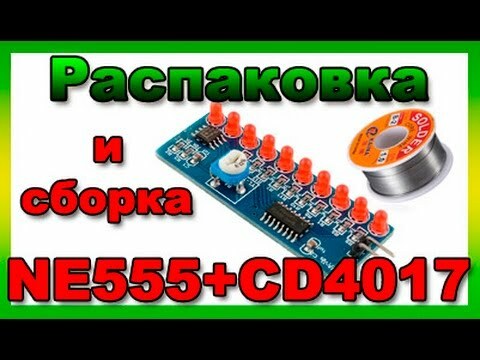 Related, this $1 DIY kit to build a 10-LED "scanner" uses a SMT 555, 4017 and lots of SMT passives. Well worth the dollar just for SMT soldering practice. I built one today. A very high quality PCB. Not my finest soldering job (prolly shoulda cleaned the board with alcohol first) but she worked first time. Wow, I need plenty of light and reading glasses to solder those tiny SMT caps & resistors in place. The 50K trimpot seemed huge & bulky, so I replaced it with a 22K fixed resistor. It only scans in one direction, so it's not quite a KITT scanner. It only draws 4 mA powered by a 3.7V LiPo cell. That's so little that you can safely power it directly from a Propeller or Stamp pin to switch it on or off. Ten strobing LEDs is certainly more blingy than a single LED. Alternatively, you could leave off the 555 timer (heresy within this thread, I know) and send your pulses directly to the 4017 decade counter clock input to advance the LEDs any way you please. Had to see it built and flashing, this would be a good exercise in SMD. Wow if you could get kits that cheep when we were kids. Plus all gratification in lights, that took a lot more to make happen back then. I wonder if through hole will be eventually phased out over time. It might actually be cheaper for China to assemble these than pack out this kit. Unless they want us Yanks to kill ourselves off using toxic leaded solder, just for the challenge of mastering SMT! This might be a good kit to buy if you need to screen some lab techs in an interview situation. And you can let them take the kit home when the interview is over, so they don't feel like they've done free labor under the guise of a job interview. Excellent, make it a competition. First guy to complete a working unit gets the job. GO! Erco, that Russian assembly video with the Russian mood music was ... different. I got an email today from an electronics company that shall remain nameless. But anybody in this hemisphere into electronics has dealt with them before. I had put together a nicer end product back in the 70s. I don't think there is a good side to this example. This type of kit should have it's own special box, even if you have to cut the holes in it. You end up with something pleasant to look at. This doesn't even have red diffused plexiglass, to read the display in sunlight. If this is a one board clock kit, mounting options are limited. The people putting the examples out there should pay a little more attention to detail though. This is plain ugly. That picture is totally photoshopped. The red segments would never look like that in daylight. OK, 4.4 cents for a 555 timer, 10 cents for photocells, so what's our first product guys? Something we can sell for 2000% profit. Nothing but 555s and photocells and other penny items. Had to show this little gadget, a sonic mole chaser. And no, I don't think their effective. That's why it only gets Dollar Store D cells. But anyway this 555 has been underground for over 15 years, energizing an audible mechanical buzzer, a couple of seconds every 30 seconds or so. Still going strong, it may be comforting for the little critters. Nice 7555. I just built a 555 38 kHz oscillator yesterday for an object detector. Handy little critters. 4.4 cents for a 555. Wow! Looks great, but does it use 5k resistors as mentioned above ? If not, then it's not really a '555' is it ? 4.4 cents for a 555 is persuasive. But, from long experience I know that my new design will be finished faster if I use a 60-cent PIC16F54. I'll be happier with the final results, too. Maybe it's a lack of cleverness that has me using complicated tools to do simple things. How much more admirable it would be to use simple tools to do complicated things. How much is the matching socket? Completion costs certainly matter, as do total BOM + Placement costs, and while Digikey has decent stocks of NE555, they are eclipsed by SOT23-6 MCUs, and a total of ~ 30 modest MCUs show more stocks than the highest NE555 hit. Asian MCU prices can also be lower, these appear on a recent web update (numbers are F.ram.K.flash.S.uarts), not sure of /volumes ? 10k ? Honestly only paid attention to the last three numbers. Is this the big brother of 555's? Where did they stop reinventing this wheel, till it could sink a heavy load all by itself. Why not, a timer is a timer, and the less components it takes to do the job the better, right? Sometimes I think I'm stuck in TTL land. BTW: Heater's example is good for 1500W, by size alone. I have been wondering how I'm going to make a PCB for this monster 555. Somewhere I have a big sheet of old style phenolic PCB. 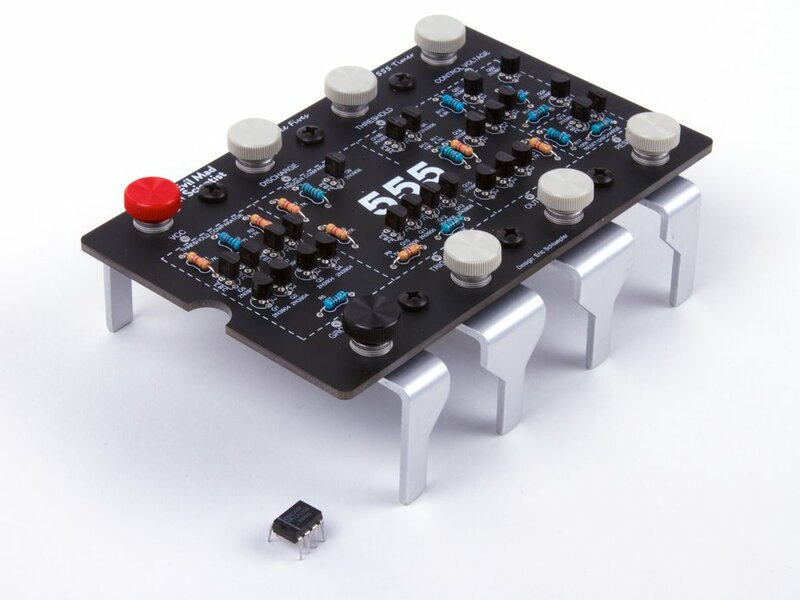 If you are ok with '555-like', new devices that sit between Logic and MCUs are these from Silego. Very small QFN's, and quite a family there now. I could see that as a culmination of design logic. But what am I supposed to do with this spec of material I have already lost. My mind was fairly blown by the Silego GreenPAK programmable mixed-signal chips(!). Didn't know anything about them until now. They are certain to be part of future considerations - they almost demand to be used.